In the best of Schubert, we’ll be looking at six compositions by Schubert that are very innovative and well-known. Hopefully this’ll give you a good sense of his musical style, and an idea of the era – late-Classical to early-Romantic. The first three songs are vocal and piano pieces, since that was a significant portion of his output. He wrote over 600 lieder, among other vocal works. The next three songs are instrumental – one for solo piano, one quintet, and, of course, a symphony. 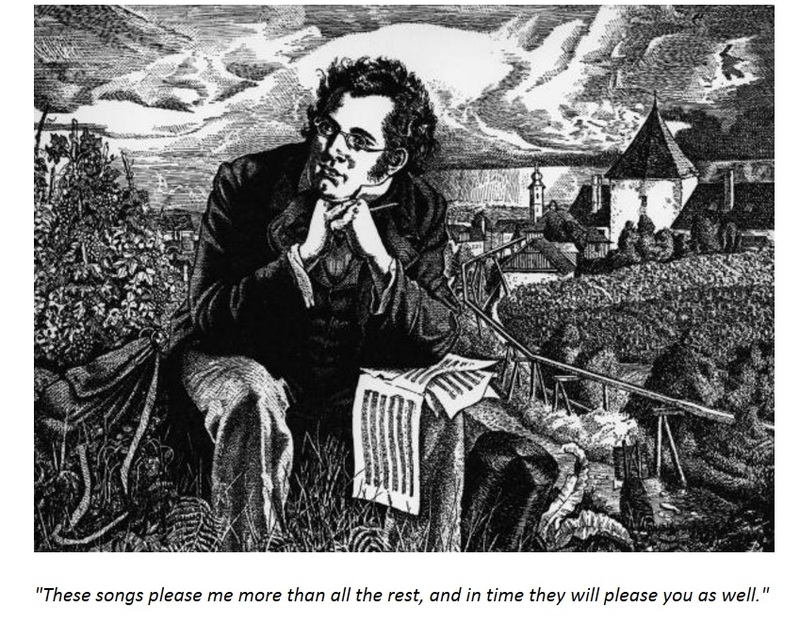 Schubert’s main contribution to the music world was through his Lieder. A Lied is a song for vocals and piano, telling a story based on a poem. Lieder are short songs, and it’s thought that Schubert’s short lieder were a big influence on Romantic composers creating shorter pieces. This practice wasn’t at all common in the Classical era. Schubert wrote over 600 Lieder in his lifetime, one of the most famous being the Erlkonig. He was one of the first composers to create “images” with piano, such as a galloping horse in Erlkonig. His use of harmony was very ahead of his time for a late-Classical, early-Romantic composer. There’s a lot of misconceptions about Schubert’s “Ave Maria”, which is Latin for “Hail Mary”. There’s a traditional Roman Catholic tune that goes by the same name, so sometimes there’s the misconception that he originally wrote the church version – he didn’t. It is, however, a widely popular work, composed in 1825. Schubert wrote music based on the poem “The Lady of the Lake” by Walter Scott, something he did with many of his compositions. Franz Liszt made a few versions of this piece for piano – Liszt was a big fan of Schubert and transcribed a lot of his pieces. Because this song, composed for voice and piano, is based off a poem, it’s got kind of a crazy story. Originally titled “Ellen’s Third Song”, it’s about this girl Ellen (aka the Lady of the Lake), is living in a goblin’s cave with her dad, since her dad refused to fight in Roderick Dhu’s army in rebellion against King James. Roderick Dhu is leading his warriors into battle when he hears Ellen singing a prayer to the Virgin Mary (Ave Maria being the prayer she’s singing). Roderick hears this, pauses for a moment, then heads into battle. Erlkonig is a lied written by Schubert in 1815, and it’s based off a famous poem by von Goethe. It deals with supernatural themes, something that was very common in the Romantic era. The story of the poem is pretty dark. It’s about a father and his young son, who are riding home together on a horse, at nighttime. The son is being chased by this being called “The Erlking”, and the son is seeing things the father doesn’t – other beings, perhaps – which the father plays down to “rustling leaves” or “just a wisp of fog”. Finally, the child is attacked by the Erlking and is killed. Once the father makes it home, he realizes his son is dead. For such an intense storyline, you can imagine that the music must be equally intense. The piano is very difficult, playing fast, restless patterns right up until the very end. The male voice has a tough time of it, too, because he has to convey four different characters – the narrator, the father, the son, and the Erlking, each in a different vocal range and with different rhythms. The piano can be thought of as adding a fifth character to the mix, since it’s representing the frantic sound of a galloping horse. As he did with many of Schubert’s compositions, Franz Liszt created a solo piano version of The Erlking as well. Song cycles were sort of like albums in the Romantic era. They were a collection of short songs meant to be played in sequence, and usually written for solo voice. Since Schubert was such a huge composer of Lieder, it was only natural that he composed song cycles as well, since they’re basically an ordered collection of Lieder, and tells a longer, larger story. Winterreise, translated to Winter Journey, is one of Schubert’s best and well-known song cycles. It’s a collection of 24 Lieder, or individual songs, meant to be heard in sequence. The songs use 24 poems by Wilhelm Muller under the same title (Winterreise). One awesome thing that Schubert does in Winterreise is make the piano just as important as the singer – traditionally, the instrumentation was all background music to spotlight the singer, but Schubert wanted the piano to help tell the story and create imagery. The story of Winterreise is about a spurned lover (the character of the poet) – the object of their affection is into someone else, and this poet goes on a journey in the dark winter night to a village, all the while longing for death and experiencing loneliness. The landscape in which this character travels is really the landscape of his heart, and everything he encounters along the way act as a mirror to his pain. It is one of the most challenging group of songs for any singer, requiring not only good chops but great interpretive skills as well. The song from Winterreise that I’d like to show you today is called “Das Wirsthaus”, which means “The Inn”. It’s a pretty sad and slow tune, but very beautiful. In his journey, the main character approaches a graveyard (which is the “inn”), and he wants to enter but all the “rooms” are taken. So he resolves to carry on and keep traveling. Now let’s take a listen to some of Schubert’s instrumental music. We’ll listen to a symphony, a quintet, and a solo piano piece. But Schubert’s version used only one violin, and added a double bass for a deeper sound. I wanted to include this one for a few reasons. First, I wanted to show you that Schubert wasn’t all doom and gloom – this piece is fairly relaxed and amiable. 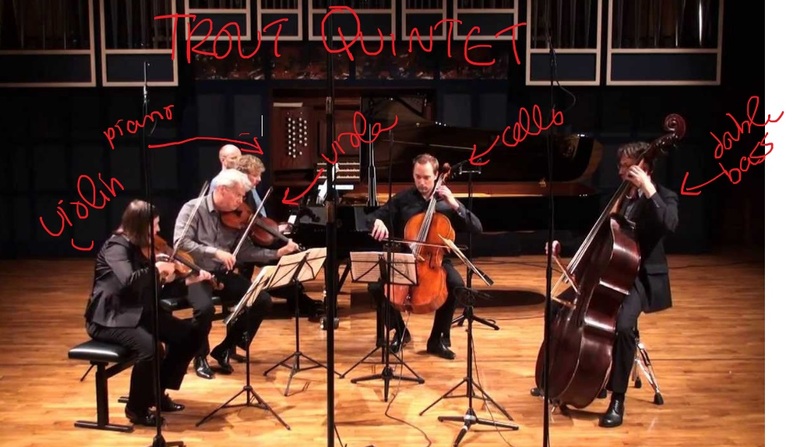 It’s also unique for chamber music in that the piano focuses on the higher notes, which works because the double bass fills out the sound with low notes. It’s written in “Theme and Variations” form, which means the melody is introduced, and then repeated and altered throughout the rest of the piece. Schubert wrote eight impromptus in 1827 for solo piano. In books and CDs, the impromptus are usually combined with another famous collection by Schubert for solo piano, Six Moments Musicaux. We’re going to listen to his third impromptu in G flat major, because it’s a beautiful serenade with a simple but very beautiful melody, which was one of Schubert’s main gifts. I love how the fast arpeggios of the left hand contrast with the very slow-moving melody in the right hand. Though we’re only going to listen to a few moments of this piece, I encourage you to listen to the whole thing, so you can hear all of the modulations and melodic changes. Composed by Franz Schubert (1797-1828). Edited by Murray Baylor. Masterworks; Piano Collection. Alfred Masterwork Edition. Classical; Masterwork; Romantic. Book. 112 pages. Published by Alfred Music (AP.530). For a final instrumental piece, I want to look at Schubert’s 9th symphony, nicknamed “The Great”. It’s a huge symphony, nearly an hour long, and extremely ambitious and difficult. Schubert probably never heard it performed in his lifetime, since he was too poor to hire an orchestra and it was too difficult for amateurs. But luckily, ten years after Schubert’s death, Robert Schumann came across the manuscript for the symphony, and shared it with Felix Mendelssohn. It was performed for the first time in 1839. Schumann praised the symphony for its “heavenly length”. However, this length wasn’t so heavenly for performers. When Mendelssohn shared the manuscript with the London and Paris symphonies, they flat-out refused to play it. The London violinists famously burst into laughter when they were rehearsing the finale. Difficulty aside, this piece is very innovative. Schubert emphasized melody, unsurprisingly, moving away from Classical symphony style by Beethoven and Mozart. He gives the trombones prominent roles, something that was previously very uncommon. I hope you’ve enjoyed this tour of the best of Schubert. Hopefully this gives you a sense of his musical style, and maybe you’ve found something awesome and new to listen to.